As you may know, we are seeing a lot of attention placed on bed bugs recently. Getting rid of a bed bug infestation is not an easy task. Most cases of bed bug infestation are treated using pesticides by a pest-control expert, however we are seeing an alternative to the pesticide treatment for removing these little buggers. 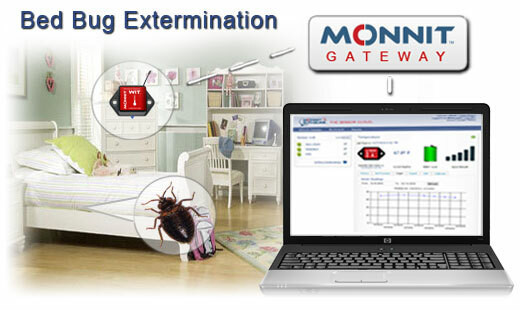 An alternative process to removing bed bugs, is to bring the temperature of each room up to 140°F for 3-4 hours. In order for this process to be effective it is important that every area maintains the required temperature for the given amount of time. So, how do you know that those little nooks and crannies are reaching the right temperature? We recommend using Monnit’s affordable wireless temperature sensors to monitor temperatures throughout the home. There are no wires to worry about, and the setup process is amazingly simple. Server rooms and data centers are full of expensive computers and networking equipment that are designed to operate within a given temperature range. General recommendations for server room temperature are 10°C (50°F) on the low side and 28°C (82°F) on the high side. In order to stay within these maximum thresholds it is recommended to keep your server room around 20-21°C (68-71°F). Most data centers or server rooms are built specifically for the purpose of housing computer equipment and are well insulated for temperature as well as fire precautions. They also have their own HVAC system designed to maintain the proper temperature within the room. Unfortunately these HVAC systems are not generally tied to the server system and can not determine the temperature at each specific server location. There may be areas of your server room that do not have proper ventilation, causing warm or cold areas where a server may be located. How do you know that the air conditioning unit hasn’t shut down accidentally during the night or weekend when nobody is around to check? How Can Monnit Wireless Sensors Help? 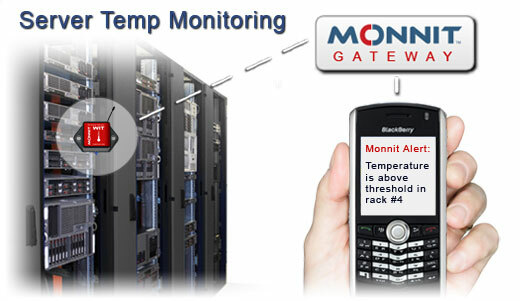 Monnit’s wireless sensor networks provide a high performance, low power (and extremely low cost) alternative to similar products for monitoring server temperatures. While other units cost hundreds of dollars and are tied directly to the server location, Monnit wireless sensors start at $30 each and can be deployed anywhere in the data center giving you real time temperature readings from any location. For the same cost as a wired temperature monitoring device you can deploy multiple Monnit sensors wirelessly, covering a larger area. By the way, you can add other sensor types to your network and monitor for things like water, humidity, light and access to the server room or cabinets. We came across this great article talking about “Internet of Things” and how it will grow to encompass almost 16 billion connectable devices worldwide by 2020, according to a new report published by Analysys Mason, the global telecoms, media and IT adviser.